Stephen Lloyd has spoken to the Herald about being at the ‘centre of a firestorm’ after resigning from the Lib Dem party whip yesterday over Brexit (December 7). The Eastbourne MP said he quit the whip so he could honour Eastbourne’s Leave result by voting for Theresa May’s deal on Tuesday (December 11). We caught up with Mr Lloyd at Shades café in The Beacon to interview him about his mad 24 hours. 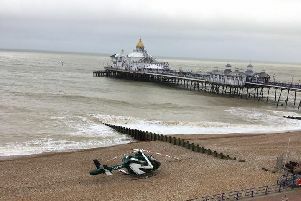 He says the reaction from people in Eastbourne has been ‘stunning’, “I started this morning at a meeting in the town hall, lovely people were coming in being very supportive. “People were just wonderful, it’s so humbling. People have been very sweet. Does he regret making that promise? For the past few weeks, Mr Lloyd said he has received thousands of ‘pretty abusive’ messages on Twitter about his decision to back the Brexit deal. A van was seen driving around town at the weekend with his photo on it and prominent Remainer Lord Andrew Adonis has been criticising Lloyd for his stance. Yesterday the MP’s name was trending on Twitter – and the opinions came flooding in. A Remainer who says he still believes we would be better off in the EU, Mr Lloyd says he believes people voted for Brexit because they feel ‘let down and angry’. He said, “The key reason I made that promise is, though I totally disagree with Brexit, I understand other people’s anger at feeling ignored by ‘the establishment’. Mr Lloyd said he could see the party was not going to remove the whip from him, so he resigned instead to ‘take the pressure off’ his colleagues. He says he hopes to rejoin the party at ‘an appropriate time’ and in the meantime will vote with the Lib Dems for ‘99 per cent’ of the time. He will ‘never’ support a no-deal Brexit and has no intentions to call a by-election in Eastbourne, he said. When asked whether he believes his Eastbourne constituents even want Theresa May’s Brexit deal, he said, “My promise was very clear. It wasn’t if I like the deal or if others like the deal. Finally, he reflects on his job as Eastbourne’s MP. “It is the most interesting job I have done and the greatest privilege I will ever have up until the day I keel over.